Elaine Weiss. "The Woman’s Hour: The Great Fight to Win the Vote." Viking, 2018. 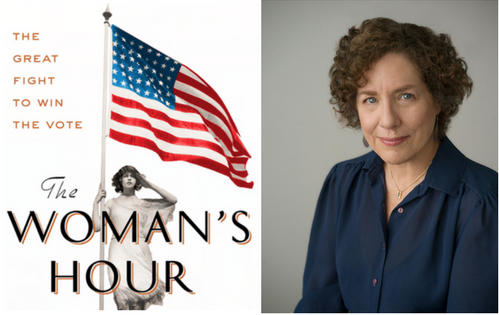 Journalist and author Elaine Weiss‘ new book The Woman’s Hour: The Great Fight to Win the Vote is a page-turning history of the fight over suffrage in Tennessee. The state’s 1920 ratification of the 19th Amendment clinched suffrage for the whole country. Alex Kane: Before getting into questions related to the content of your book, I’d love to hear about your research process for writing it. What were the most helpful sources you used in constructing the story, and was there any genre of media, like newspapers or private letters, that you used more often than other types of sources? Elaine Weiss: I’m trained as a journalist and was a journalist all my career. So, for me, it’s the combination of reading the newspaper accounts and the archives and juxtaposing them that I find so fascinating. My first line of research was at the Tennessee State Library and Archives. Carrie Catt, the president of the National American Woman Suffrage Association, is in residence in Nashville for six weeks during this final fight. She’s directing the National’s campaign there. She either donated or just left all her correspondence from the months of May, June, July and August [1920 to the archives]. The state archives have a very nice collection of documents, memoranda, letters that go between the Tennessee suffragists who are trying to encourage her to mount a fight, to mount a ratification campaign in Tennessee, even though it does not look terribly promising at the beginning, in the early summer months. They’re trying to convince her that Tennessee can do it. And there are all kinds of problems for Tennessee. And they’re discussing that. So that was incredibly valuable. And there are newspaper clippings, and best for me was the clipping service—the national headquarters would send all the relevant clippings from other newspapers to Carrie Catt in batches. Those are there, and those include cartoons from other publications around the country and editorial articles about it. So, there’s a very rich archive for me to reconstruct those days almost by the hour. That was my first source. Also, at the Tennessee State Library and Archives, I was able to buy microfilm so I could have the letters of the prominent anti-suffragist, who was also working in Nashville during this time. I could get the official letters of the governor, who’s very involved in this fight. Just there in Nashville, I was able to have a pretty nice beginning. They also had a vertical file which had an assortment of articles, including during the 1940s and 1950s, of people reminiscing who were still alive. That was very useful. The second line of archival research was the Library of Congress. There were the official papers of both the National American Woman Suffrage Association and the Women’s Party. And the Women’s Party papers were especially useful to me because these were the daily memoranda and the letters and notes that were going back and forth between [suffrage leader] Alice Paul, who remained at headquarters in Washington, and her lieutenants, who she sent to Tennessee. They’re organized in the Library of Congress file on that microfilm chronologically, which was great for me. I could read from May until September or October, but I had to go through the archives every day. I had to wade through a fair amount. But it was a gold mine. It was everything that went in and out of the office. And so I could have some things that you wouldn’t think would be useful, like the secretary at the headquarters’ office writing to women who would donate ten dollars and giving an update on what the mood was at headquarters that day. And she’d say, “we’re very upset because this has happened and this has happened. We don’t believe that the men are going to do this,” and so I could get an unofficial sense of what was going on from the wonderfully catty secretary. And that’s all in the Library of Congress. The next line was the daily newspapers in Tennessee, and I could get most of this either through microfilm from the Tennessee archives or on the Library of Congress’ Chronicling America. That usually ends at the first phase ends in 1922, which is perfect for me since this is all taking place in 1920. A few of the smaller Tennessee newspapers and one of the Memphis papers is in that catalog of newspapers. And then I needed The National Tennessean, which is on ProQuest. I could do a search and have all the papers they subscribe to which are the major ones for me: The New York Times, The Washington Post, The Wall Street Journal, Chicago Tribune, Baltimore Sun, and The Christian Science Monitor. And all of these newspapers have different attitudes toward suffrage, and you could see the difference between the editorial policy and the reportage—very interesting for a journalist to observe. And they all give me different perspectives and they covered what was happening in Nashville in different ways. Many of them have reporters on the scene. Some of them just took AP wire reports. It was really interesting to use a combination of the Tennessee newspapers, which in some ways were more detailed, and then the major national newspapers which were covering this. AK: What was the media landscape like in Tennessee regarding suffrage? What kind of division or consensus existed among newspaper publishers on the issue of suffrage? EW: In Tennessee, it’s fascinating. One of the prime subplots of my book is the feud that is playing out between the two major newspaper publishers in Nashville at the time. So you have Luke Lea, who is the founder and the publisher of The Nashville Tennessean, a pretty major newspaper. And he had been a U.S. Senator. He had been a war hero in World War I and he founds The Tennessean to be a mouthpiece for his political views, which are pretty progressive for the time. He’s always been a suffrage supporter, even when he was in the U.S. Senate. He’s also a Prohibitionist. He’s a dry advocate. And that’s very clear in his newspaper because he is supporting the suffragists and the ratification fight. The other major national newspaper at the time is The Nashville Banner, which is founded and published by a man named Edward Stahlman. He is a German immigrant—came as a boy—and self-made man who, before he bought the newspaper, was an executive of the Louisville and Nashville Railroad, which had enormous economic and political power in the state. These two men are mortal enemies. It gets really ugly. The Tennessean calls Stahlman unpatriotic during World War I because he’s German. There’s an FBI investigation of him as an enemy alien. And this is playing out during the suffrage fight. The Banner has never been a real supporter of suffrage, but was kind of neutral, and was okay in its reportage. But then comes this big fight. Stahlman promises the suffragists that he’ll support them and then he betrays them, and it has very much to do with this personal feud and newspaper feud because they slam each other in the editorials. They call each other names. It’s really quite colorful. In Chattanooga it gets even more interesting. Imagine MSNBC and Fox News in each city in Tennessee, and they have really different approaches and different attitudes. You have a newspaper called The Chattanooga News, which is owned by a very progressive newspaperman named George Milton. His wife is the president of the Tennessee suffragist organization. So she’s in the battle, he’s there in Nashville writing complimentary editorials for the suffragists. The other major newspaper in Chattanooga is Adolph Ochs’ Chattanooga Times, which was his first newspaper before he bought the New York Times. So like The New York Times, it is rabidly anti-suffrage. So The Chattanooga Times is mind boggling in its editorial coverage. It is way over the line in its animosity toward suffrage. But the reporting is very detailed. The reporting is excellent and very valuable to me. So you can see how I can have all these different streams of contemporary reporting, and I make this timeline really by the hour because things change by the hour. AK: And what about the national coverage? How extensive was it? EW: Very extensive. Because it’s not just Tennessee. Everyone realizes this is going to decide whether the 19th Amendment is ratified anytime soon. Because if it fails in Tennessee, chances are it’s not going to happen for a long time because most of the other Southern states have rejected it. It only takes 13 states to reject it and it’s dead. There’s already nine or ten that rejected it. And there are three states that are going to refuse to consider it for political and corporate reasons—they’re under corporate pressures. Those are Connecticut, Vermont and Florida, and in Connecticut and Vermont the legislatures would probably ratify, but the governors refuse to call them into special session. So everyone realizes 27 million women could get the vote if this passes and so they do send reporters. Of the major national newspapers, everyone pretty much has a reporter. For instance, by this time New York women have the vote. The Times’ animosity towards suffrage is still really there, especially in the editorial. But it’s covering it in a little more neutral way because the women citizens of New York now have a vote. I think they are moderating that tone in New York, though not in Chattanooga. So The Times is there and covering it pretty much every day. The Washington Post covers it thoroughly. The Christian Science Monitor does a very good job. It’s a major newspaper at this point. The Baltimore Sun is against and the 19th amendment has already been rejected in Maryland. AK: Was there anything particularly unique about the debate and vote in Tennessee that didn’t come up in other states that voted on suffrage? What role did Tennesse’s political divisions and culture have on the debate? EW: It wasn’t just what’s happening on the ground [in Tennessee]. It’s what’s happening in the nation because it’s a presidential election, and so that enters into it very heavily. It’s the mood of the nation moving from an unpopular war and debate over the League of Nations, about what America’s role in the world is. A lot of nervousness about immigration, about automation, about people losing jobs to automation. It’s everything we’re talking about now. But then you also have the corporate interests. The railroads are against it. The textile manufacturers are afraid women are going to abolish child labor and they depend on that. And also the liquor industry—you know, Jack Daniels. And the bourbon and liquor industries are very big in Tennessee. Prohibition has just been enacted but they’re hoping it won’t be enforced, and they’re afraid if women can vote they’re going to insist on strict enforcement. Then you have the states’ rights argument. The shadows of the Civil War are all over this story. They use Confederate imagery and Confederate language in the broadsides, in the photographs that the anti-suffragists distributed. The argument is that if all women can vote, black women can vote, and they’re not going to stand for that. Black men, of course, have had the vote legally since the end of the Civil War, but they’ve been disenfranchised effectively by Jim Crow laws, by onerous poll taxes and crazy literacy tests. The Grandfather Clause has actually been struck down, but they have many creative ways, including physical intimidation and lynchings, to stop black men, and they don’t really want to deal with black women. They’re not sure they can suppress them the same way. That is the main theme going on. The secondary one is states’ rights. They don’t want the federal government coming in, like they did in Reconstruction, and telling them what to do. And this is a federal amendment, and they don’t want the feds looking into their polling booth and telling them who can vote. We see that again in the 1960s during the campaign for voting rights. Same thing for integration, and same thing now happening with voter suppression—states’ rights issue. So, these themes which we think are historical and play a big role in the story in Tennessee, we’re still dealing with, which is what I’ve found so fascinating. AK: I have a final question: If you could choose, what do you think is the most important lesson that readers would take away from your book? EW: I can tell you what surprised me and then I’ll tell you the lesson. The thing that surprised me in the research, is a), that it took so long. This is seven decades of women working for this— three generations. Carrie Catt had a rough estimate and says it’s over 900 campaigns that they’ve done at the local, state and national level—a huge organizational and political effort. So, the first thing that struck me is that this took so long. Second the racial aspect of it—I had not anticipated that. And not just what happens in Tennessee, which is explosive. But that race was an issue in suffrage from the very beginning because it comes out of the abolition movement. They’re almost sibling causes that grow up together with many of the same participants. The women we think of as the foremothers, Stanton and Anthony, Lucretia Mott and Lucy Stone, are really abolitionists first. They come to suffrage through their experiences and this idea of universal personhood and universal suffrage. And they really expect to get it after the Civil War and of course there’s a huge split. The other abolitionists who they work with closely for decades say, “the woman’s hour is not now. This is not the woman’s hour.” And that’s where the title of my book comes from. And the women wait for another 50 years, and then the racial aspect comes back in the last phase of the movement when it’s going to be decided in the Southern states. So that was very surprising to me. Also surprising is the fact that there were women who opposed suffrage so stridently, like the muckraking journalist editor Ida Tarbell. She’s vice president of the anti-suffrage league. Eleanor Roosevelt’s not a suffragist. So that’s surprising. I think the reader will be surprised. But they didn’t just protest. They also had to develop very sophisticated political strategies. And the other thing is to realize how sophisticated their political operation was—and I’m talking about both the mainstream suffragists and Alice Paul’s National Women’s Party. And then also, that reform movements almost always split at some point. And that’s true for the abolitionists, for the African-American civil rights movement, the labor movement, the gay rights movement, the new iterations of women’s movements. It’s natural to have different strategies and different tactical paths. And the lesson is to try to harness those different energies rather than allow it to dissipate the momentum. So that’s what I see as lessons for now.